Visit medavis, THE specialist in radiology software at Radiology Asia in Singapore and find out how our solutions can help you to increase speed, quality, efficiency and economics of your radiological institution. Whether public or private hospital, imaging center or radiological network, we have the optimal workflow solution for you: modern, standards-compliant, flexible, scalable and modular. medavis is an owner-managed, medium-sized company, established in more than 20 countries and offers 22 years of experience, quality and innovation made in Germany. Why can medavis RIS do more? 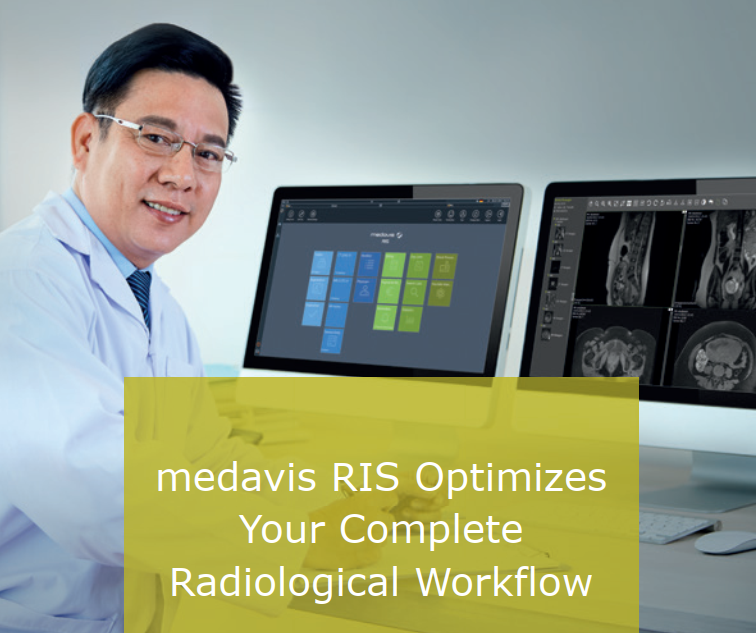 Thanks to its speed and well thought-out workflows, medavis’ Radiology Information System (RIS) is one of the most innovative solutions worldwide. It integrates smoothly into existing IT structures and enables you to create a streamlined multi-site-environment workflow, based on your requirements. With the web-based medavis REFERRER PORTAL you can share reports and images with your referring colleagues – fast, safe, 24/7. With this instrument for referrer loyalty you increase the reputation of your radiology. Treatment cycles are shorter and faster, and working is more comfortable.